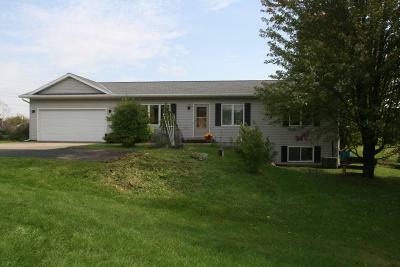 4803 Oregon Tr, Oregon, WI.| MLS# 1854292 | John Reuter Realtor/Broker/Owner of The Reuter Team. Wisconsin Homes for Heroes Realtor. Proud to be the Top Homes for Heroes Realtors in Wisconsin and One the Top Homes for Heroes Realtors in the United States. This 3 bedroom, 1.5 bath ranch will delight you! All you need on one level plus great exposed lower level with rough in for bath if you'd like more living space in the future. Easy access to Oregon yet country living with over 1/2 acre that boasts beautiful flower and vegetable gardens, trees, lawn space and shed. This light filled home has been lovingly updated: Carpet and linoleum 2019, utility sink in basement 2018, Furnace and AC 2017, Water Heater 2015, Roof 2014, Bedroom built ins 2013, Living room built in & main floor windows 2012. Relax on your deck and take it all in! Directions: From Oregon, Hwy Mm To West On Oregon Trail.